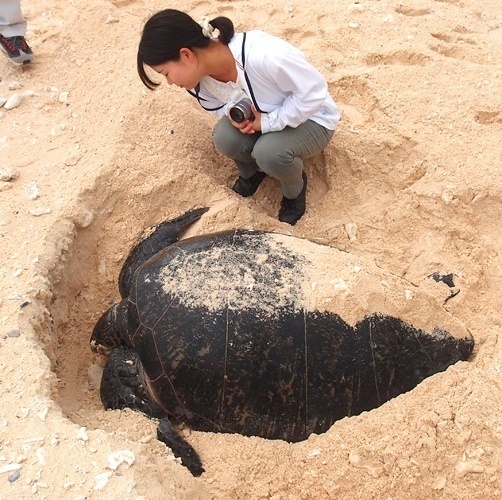 A green turtle trapped in a sand hole at Yubukuhama beach, Tonakai Village, on May 30. On May 30, at Yubukuhama beach on Tonaki Island, a local resident found a green sea turtle unable to move in the sand and notified the village office. The turtle was 130 cm in length. It seemed that the turtle was trapped in a hole, which she had dug to lay her eggs. The village office staff helped dig her out a bit, and the turtle was able to go back slowly to the sea by herself. Many green turtles live in the sea surrounding Tonaki Island.